Utah has some gorgeous slot canyons! I often have people from out-of-state asking me where they can go to hike in one of Utah’s famed canyons. 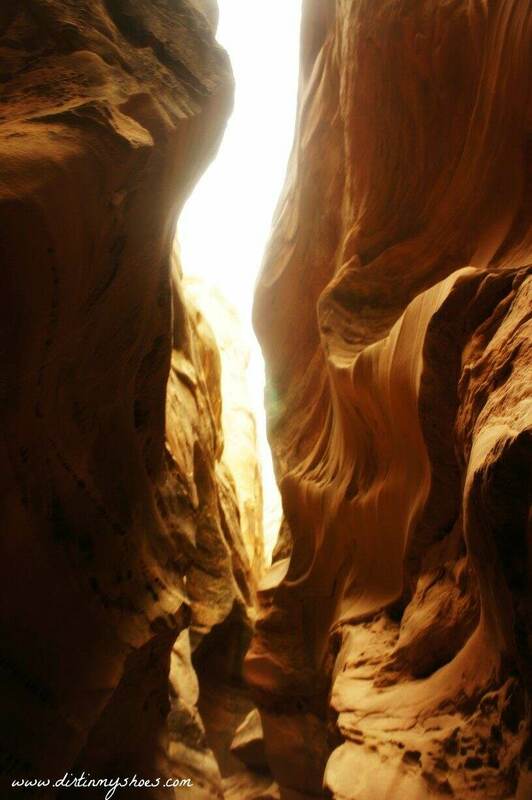 Little Wild Horse Slot Canyon in the San Rafael Swell is a great place to start because it is easily accessible, does not require canyoneering skills, is family friendly, and provides a killer experience through some narrows. Even though the trail can get busy, I had a great time in this slot canyon! In some spots it gets so narrow that your feet don’t even fit in between the canyon walls and you have to walk one in front of the other. Don’t worry though, the whole thing isn’t that narrow. It opens up wide a couple of times to give you a breath of fresh air. This hike starts just a very short drive from Goblin Valley State Park or a longer drive from Green River. From the trailhead, you will follow a dry wash for 0.5 miles until you reach a dryfall that is easily climbed around on the left side. Just past the dryfall, the trail splits. If you stay straight, you will be taken to Bell Canyon, so be sure to take a right to head toward Little Wild Horse. Then after a few steps on the right branch of the trail, watch carefully for a cairn (man-made pile of rocks) to instruct you where to turn to get into the slot canyon. From there, it is just a few steps into the Narrows of Little Wild Horse. Trail mileage varies because you can turn around at any time and go back the way you came, making this perfect for young children. If you have a half a day, take the full loop up through Little Wild Horse and down through Bell, which is approximately 8 miles. As always, don’t hike a slot canyon when it is raining or if there is rain forecasted in the area. You definitely do not want to get caught in a flash flood while in this canyon. Be smart…it’s better to be safe than sorry. Plan for hot temperatures and make sure to bring plenty of water and sunscreen. This trail gets very busy. We had to park along the road because the parking lot was full, and along the trail we had to wait for a few groups to pass through the narrows before we could enter. Because it is such an easily accessible trail (compared to many other slot canyons in Utah), Little Wild Horse Canyon is a very popular trail. Don’t be deterred….it is definitely worth braving the crowds! From Green River, take I-70 west for 11 miles to Highway 24, exit 149. Travel south on Highway 24 for about 25 miles until you reach the turnoff to Goblin Valley State Park. Continue to follow the signs towards Goblin Valley for 11 miles. Before reaching the fee station for Goblin Valley, turn right onto a dirt road labeled Wild Horse Mesa and Muddy Creek. Follow this dirt road for 5.3 miles to reach the trailhead for Little Wild Horse Canyon. Tell me about your slot canyon adventures! Hey Alicia! It would be very fun to meet you! Do you have a favorite trail? Headed to Goblin Valley next week to do this hike. If doing a loop, I like going up Bell and down LWH. Have you ever hiked Crack canyon near Goblin Valley? I want to try that next week but have never hiked it. Do you? Most people go up LWH and down Bell….do you know a secret that I don’t?! I have never done Crack Canyon, but I think that you should and tell me how it goes!